Today the Confederate Battle Flag has became a frequent issue in the news. The fact that the hate groups and others have changed the true meaning of this flag is a shame to those of us who respect the brave men who fought for their indendence in the South.This flag was desingned, not as a symbol of hate. But as a rallying point and symbol of unity in the Confederate Army. 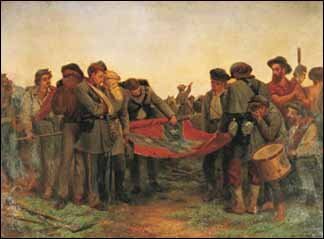 To these men, the flag was a reminber of home and loved ones, and this rather than hated, should be the legacy of the Confederate Flag. So fly the Confederate Battle Flag high, don't be ashamed. Becouse your flying it for the true meaning for what it stands for.